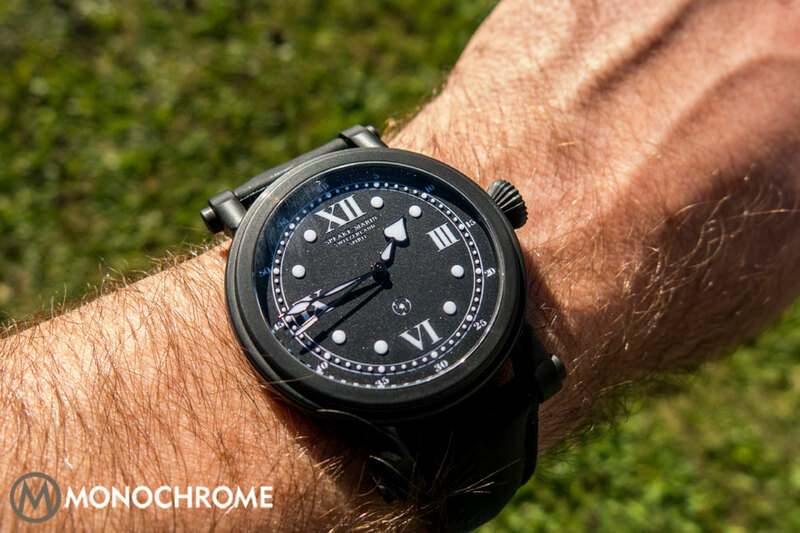 Frank Geelen runs his excellent site Monochrome based on the continent… here is his review…..
Last September, Speake-Marin introduced a new, entirely black, version of the Spirit Mk 2. When I was I was traveling in Switzerland, a few weeks ago, I decided to make a quick detour to Bursin, to see if Peter Speake-Marin was in and to see the new Spirit Mk 2 DLC. I was lucky, Peter was in and we met for dinner and I got to play with the first all black watch from Speake-Marin. The newest PSM scion is not only the most rugged and contemporary of the lot, but also the one with the friendliest price. For less than CHF 7,000 you can own a Speake-Marin. 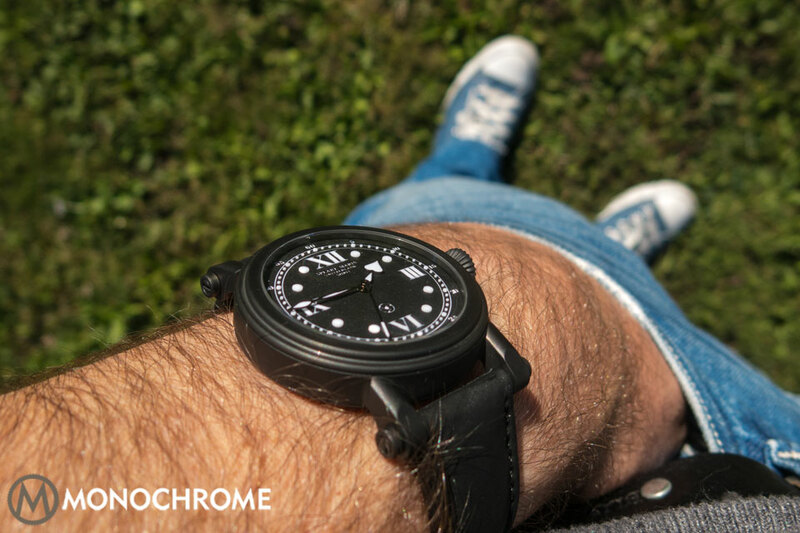 In our previous article we gave you the full description and analyses (check here), so now, after I handled the watch, I can tell you how it feels/wears/looks on the wrist. And to give it all away at once: I love it. As journalists we can talk about the specifications, but the proof of the pudding is of course to strap a watch on the wrist. And that’s something that especially online journalists, a.k.a. bloggers, do understand very well. The new Speake-Marin Spirit Mk-2 DLC has a diameter of 42mm and a height of 12mm. My own Piccadilly with enamel dial (see here) measures 38mm in diameter and to be honest I forgot the height, but it will be slightly thicker. Strange enough the new Spirit Mk-2 DLC feels like it is more or less the same size, while it is a tad thinner and has a 4mm larger diameter! Contrast on the dial is absolutely striking. 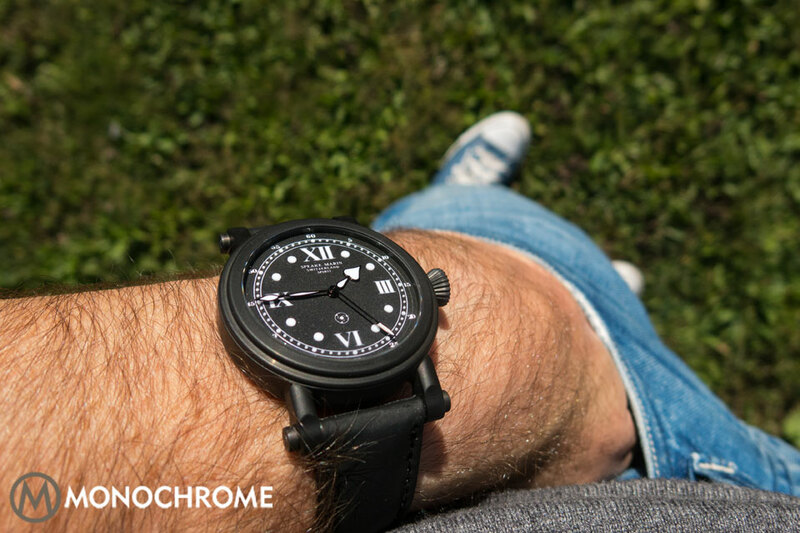 The matte black DLC coating, the matte black strap and the matte black dial, together they all have a strong contrast with the white numerals and markers. The luminescent material in all the markers and (Roman) numerals on the dial, and on the hands, is extremely strong. Peter Speake-Marin told me about the plans for next year and I must say that it all sounds extremely interesting. If you like Speake-Marin’s style, this brand is certainly something to keep a close eye on in the next years. See the entire collection and points of sale on the Speake-Marin website and follow the latest news at the Speake-Marin Facebook page.